To mark the 22nd anniversary of the establishment of the “Route du Prince Impérial”, several events are being held as part of “French Week in Pietermaritzburg”, including guided museum visits, concerts and other commemorative events. 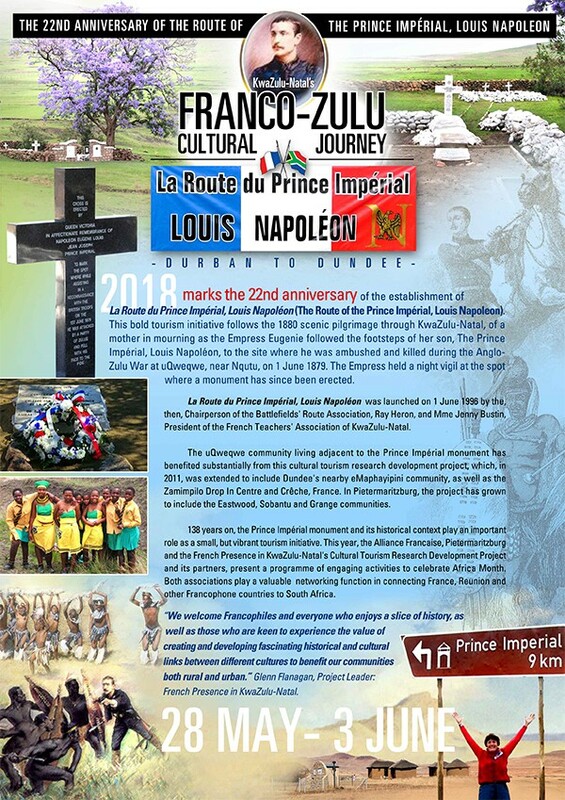 “La Route du Prince Impérial” was inaugurated on 1 June 1996 to commemorate the time Louis-Napoleon, only son of Napoléon III and his wife the Empress Eugenie, spent in South Africa before his untimely death at the hands of Zulu warriors on 1 June 1879. The route follows the footsteps of the pilgrimage made by the Prince’s grieving mother in 1880, who held a night vigil at the spot where Louis-Napoleon was killed. A monument has since been erected at this site. A concert to celebrate the 22nd anniversary of the “Route du Prince Impérial”, featuring Pietermaritzburg musicians. 18th annual memorial mass for the Prince Imperial, and also this year for Jean-Claude Lachnitt, a French specialist on the Prince Imperial.